Few people at the time believed, as they wrote in the often-quoted opening sentence of Rhizome, that “the two of us wrote Anti-Oedipus together.” They added, “Since each of us was several, that became quite a crowd.” These notes, addressed to Deleuze by Guattari in preparation for Anti-Oedipus, and annotated by Deleuze, substantiate their claim, finally bringing out the factory behind the theatre. 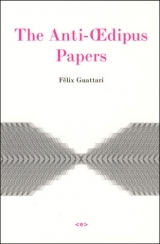 They reveal Guattari as an inventive, highly analytical, mathematically-minded “conceptor,” arguably one of the most prolific and enigmatic figures in philosophy and sociopolitical theory today. The Anti-Oedipus Papers (1969-1973) are supplemented by substantial journal entries in which Guattari describes his turbulent relationship with his analyst and teacher Jacques Lacan, his apprehensions about the publication of Anti-Oedipus and accounts of his personal and professional life as a private analyst and codirector with Jean Oury of the experimental clinic Laborde (created in the 1950s).